Amaney Jamal, Robert Keohane, David Romney, and Dustin Tingley study: Whatever America does, Arabic Twitter will hate it. Arab Twitter Users Don’t Like America. But Why, Exactly? 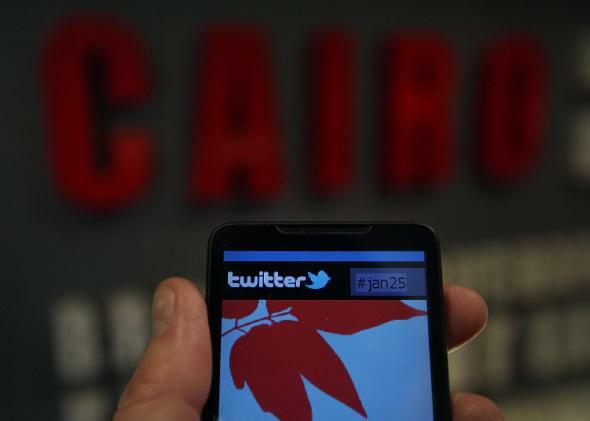 A smartphone displays a page from Twitter on Jan. 27, 2011, in Cairo. Is anti-Americanism motivated by specific U.S. policies or a more generalized antipathy to American culture? Do people who hate U.S. foreign policy also hate Americans? These are among the questions addressed in an innovative new study of anti-American attitudes among Arab Twitter users, which was presented at the American Political Science Association annual meeting here in D.C. last week. The short version of the working paper’s conclusion is that Arabic Twitter is generally anti-American (though to a lesser extent than it is anti-Iranian) but that these attitudes are motivated more by specific events than general hostility to American culture. Unfortunately, these attitudes seem to be present on multiple sides of the region’s political divides. The authors, political scientists Amaney Jamal and Robert Keohane of Princeton and David Romney and Dustin Tingley of Harvard, worked with the analytics company Crimson Hexagon to analyze the sentiment of Arabic Twitter in 2012 and 2013. Twitter users aren’t a perfect proxy for public opinion—the population is likely weighted toward younger, more educated people, and wealthier countries like Saudi Arabia and the United Arab Emirates are overrepresented. The data, though, can give a snapshot of what 3.7 million (the number of active users in Arab countries) people are thinking and provide valuable information from a number of countries that have restricted traditional public opinion polling in the past. Overall, the authors found that “the conversation on Twitter, in Arabic, about the U.S. is especially negative towards U.S. policy; the conversation about U.S. society is also mostly negative but much smaller.” But that’s less interesting than how Arabic Twitter responded to specific events. The first test case is the 2013 overthrow of Egyptian President Mohamed Morsi. Seventy-four percent of the tweets referencing the United States around the time of Morsi’s fall were negative, and only 3 percent were positive. (The rest were neutral tweets noting some piece of news.) You might expect that supporters of the coup would be less negative given Washington’s traditional friendliness toward the Egyptian military and hostility toward Morsi’s Muslim Brotherhood. But in fact, the authors write, “no matter which side of the domestic dispute an individual was on, he or she was likely to be opposed to the United States.” This fits with what was observed in reporting from the time: Despite U.S. attempts to stay (or at least appear) neutral in the conflict, both military and Muslim Brotherhood supporters believed the U.S. was working on behalf of the other side. Next, they analyzed tweets about the conflict in Syria, particularly following the chemical weapons attack in August 2013, when it appeared likely the U.S. would launch a military intervention against Bashar al-Assad’s government. While on opposite sides of the Middle East’s bloodiest conflict in decades, these Twitter users were fairly united in antipathy to the U.S. They also looked at instances where Americans were the victims. Following the 2013 Boston Marathon bombings, the largest number of non-neutral tweets (20 percent) expressed the opinion that the attack wasn’t a significant news event, followed by those expressing fears of a backlash against Muslims in the U.S. Eight percent supported conspiracy theories blaming the U.S. government for the attack. Again, there’s evidence of anti-Americanism—only 5 percent of tweets expressed sympathy for the victims—but in this case the authors didn’t observe tweets celebrating the attack on U.S. society. If all this makes it seem as if Arab tweeters are knee-jerk anti-Americans, you should see how they feel about Iranians. While trailing the United States in total references, Iran got more mentions on Arab Twitter than any other non-Arab country, ahead of Israel, Turkey, and India. The authors found political sentiment toward Iran to be “overwhelmingly negative,” with so few positive tweets that the proportion was impossible to estimate. While attitudes toward America itself, rather than American policy, often seem more ambivalent than negative, views of Iran are starker. “In both the polling data and even more in our Twitter data, one observes admiration for American popular culture, helping to create such ambivalence. There is no such Arab admiration for Iranian popular culture, and no discernible ambivalence,” they write. In terms of efforts to improve America’s image in the Arab world, the paper contains both good and bad news. Arab Twitter users’ antipathy toward America itself, or Americans, doesn’t appear to be exceptionally hostile. But suspicion and opposition to U.S. foreign policy appear to be so deep and so widely shared, even by those on opposite sides of other contentious issues, that it’s hard to imagine how the U.S. could begin to rebuild trust. There may be a lesson here for the Obama administration’s foreign policy. For understandable and sometimes admirable reasons, the administration has often tried to avoid being identified with one side or another in domestic disputes in the Arab world. The U.S. admonished the Egyptian military’s crackdown on the Muslim Brotherhood, but eventually normalized relations. It provided aid to some of the rebels fighting Assad, but not enough to really turn the tide of the civil war. Obama’s intention here may have been to combat the perception that the U.S. meddles in the internal affairs of smaller states. But in some cases, by refusing to take a side, the American government may have deepened the suspicion that nobody should trust the United States.